Generations of us have shopped at Toys R Us. We have marveled at the variety of toys, gaped at the displays, bought bikes and beds, and argued with our children over whether they really needed the latest toy trend. 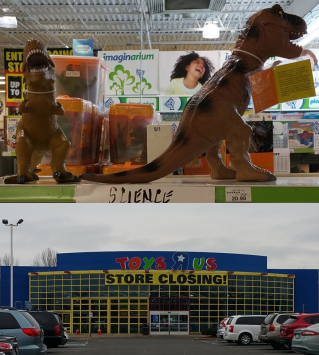 When we heard Toys R Us was closing for good, we thought, “There may never be another retail store like this. Let’s take some pictures while we still can.” So here is our homage to Toys R Us, the generations who loved it, and the time we spent dreaming there.